Next, we should discuss the different kinds of laminating machines available, and what applications and customers they suite best. There are four basic kinds of document laminating machines: 1) pouch laminators, 2) roll laminators, 3) cold laminators (also known as pressure sensitive laminators) and, 4) wide format laminators. A pouch laminating machine is the most popular and least expensive method of laminating. These machines are compact, tabletop units designed for laminating applications up to 13" wide. There are three types of heating configurations that pouch laminators use: heat plates, heat shoes and heat rollers. Older models of pouch laminators use heat plates. These work best for simple black and white copies. Heat shoes are commonly found in roll laminators as well as pouch laminators. The heat shoes provide a better quality than the heat plates, however heat shoes in pouch laminators can cause paper jams. The most consistent and dependable heating method is the heated silicon rollers. This feature is always recommended when laminating photographs. Pouch laminators offer the protection of lamination for an economical price. Some common applications are restaurant menus, book covers, photos, cookbook pages, ID badges, small signs and displays. Something to consider, however, is that the maximum length for standard laminating pouches is eighteen inches. 1) What is the largest size sheet you will be laminating? Pouch laminators are available in a variety of sizes. Binding101 offers pouch laminators capable of laminating product up to 11-1/2" x 17-1/2". Applications larger than this will require a Roll Laminator. Be sure to consider not only the size you will be doing immediately, but any sizes you might need to use in the future as well. 2) What mil (thickness) will you be using? Many Pouch Laminators are limited to running thinner lamination film, usually up to 3 or 5 mil. This film produces thinner, more flexible product. For thicker, more rigid results, a 7 or 10 mil film is necessary. Make sure that the Pouch Laminator you choose is capable of handling the mil thickness you prefer for your documents. 3) What is your volume? Speed is an important factor when choosing a Pouch Laminator. For example, if you are laminating high-volumes of documents at a time, then you don't want a laminator that only goes 12 inches per minute. Instead, you would want one than can do over 100 inches per minute. Production speed may not matter as much for low volume output, however with higher volumes; saving seconds per unit can make a significant difference and help keep costs down. 4) What is your application? Many Pouch Laminators are designed for specific applications. Some are designed specifically for basic copy paper with only light-coverage black print. For applications such as these, a heated-plate lamination system (typically the least expensive) will work fine. Other Pouch Laminators work well with photographs and specialty paper with full-coverage printing. For applications such as these, a heated-roller lamination system is the optimum choice. Many pouch laminators also offer the ability to do Foiling; an increasing trend that allows you to add attractive foil accents on your documents. A roll laminating machine is designed for laminating larger graphics as well as mounting on foam board. For two sided laminate, two rolls of laminating film are used. And for one sided laminate, one roll is used. There is a wide variety of lamination film available on the market today, however the most frequently used is thermal film. Thermal film is constructed of two layers; a polyester layer and an adhesive layer. During the laminating process, the adhesive is warmed and melted. It is then pressed into the document acting as a bonding agent. As the adhesive cools, it hardens and creates a permanent seal between the document and the film. Roll lamination is a process that involves two laminating rolls, a top and a bottom roll, and is placed on the machine with the glue sides facing each other. As the rolls are "uncoiled" a document is placed between the two pieces of laminate and are sealed as they travel through the rollers and the heat is applied. It is important to leave a small edge around the document to allow the lamination to adhere to itself. Some form of trimming is usually required with roll lamination. This lamination process is generally used for larger volume items as it can run at higher speeds and in a continuous roll. Roll laminators operate by pulling film with a thermally-activated adhesive over a heat source and into a set of laminating rollers. Film from a roll passes over heat shoes to activate a polyethylene adhesive layer on the film. It then passes through rubber rollers to apply pressure and bond the film with the item being laminated. The film will actually fuse into the item. Some great things about roll laminators are that you can add durable and protective laminate to your documents are high production rates, greatly increasing speed and efficiency. Roll laminate film is also available in a huge variety of sizes, finishes and thicknesses to choose from. There are models that are easy-to-use for schools and small offices to heavier-duty machines for the on-demand printing market. With the huge variety of roll laminators on the market, how can you choose the right one for your specific needs? Before you choose a laminating machine, it is important to consider several factors. Our experienced sales specialists have put together the most important questions to ask yourself before choosing a roll laminating machine. Review the questions below to help determine what you need. Once done, feel free to browse our selection of roll laminators or contact us at (866)537-2244 for details on specific models to meet those needs. 1) What is your application? Different applications will call for different laminating machine solutions. Think about what you need your laminator to do... will you be laminating posters, graphics and signs? Will you be mounting prints to foam boards? Will you be creating pop-up displays? Will you be applying vinyls, tapes or adhesive films? Will the applications be used outdoors, such as outdoor signage and displays? You may need to do just one application, however some systems offer money saving multi-functional capabilities. Once you have determined what you want to achieve with your laminating machine, then we can start discussing the best machine to help you achieve those goals. 2) What is the largest size sheet you will be laminating? 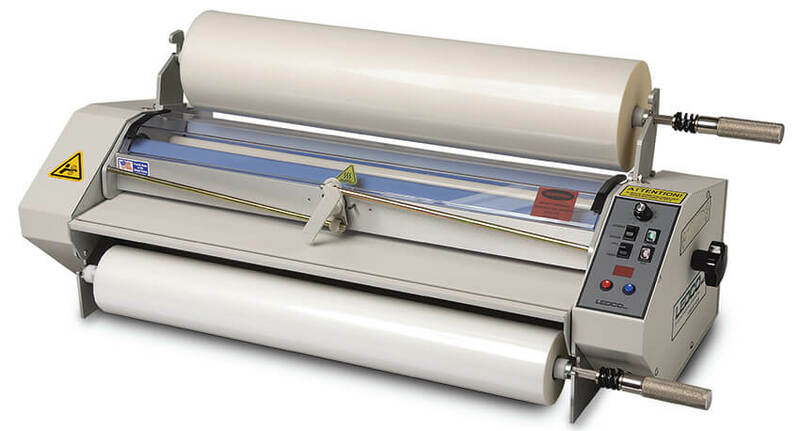 Roll Laminators range in size from 25" to 65" wide. Before investing in a roll laminating machine, be sure to consider not only your immediate width needs, but also any possible future needs. You will want to get a machine that has at least an inch or more extra space on each side to ensure proper encapsulation. It is always better to have a machine that can handle larger documents to ensure you are covered. 3) Do you need heat? Some roll laminators have the capability to do both heated lamination and cold lamination (also known as pressure sensitive laminating). Cold Laminating is required when the paper or ink is too sensitive to withstand the heat that thermal laminators apply. 4) What is your volume? Speed is an important fact when choosing a roll laminator. For example, if you are laminating high-volumes of documents at a time, then you want a machine that can laminate at high speeds, and be heavy-duty enough to power-through these large jobs. When laminating at high-output, saving seconds per print can make a significant difference and help keep costs down. On the other hand, if you are a school laminating in small intervals, then speed might not be an issue so you can invest in a slower (usually less expensive) laminator. 5) How much space do you have to work with? Roll Laminators are usually able to sit on desk-tops or stands, so it is important to determine the space you need to work with ahead of time, and compare it to the dimensions of the machine you are considering. You should also keep in mind that you will be inserting the print on one side and it will come out of another side, so additional space on both sides is required. Cold Laminators, also known as pressure sensitive laminators, are required when the ink or paper used for a print is too sensitive to withstand the heat of a thermal laminator. Often cold lamination is also used for one-sided laminating. This type of laminating machine applies a film or adhesive to the application using high pressure rollers. This process requires no electricity, eliminating warm-up and cool down time and confusing adjustments to tension and temperature. 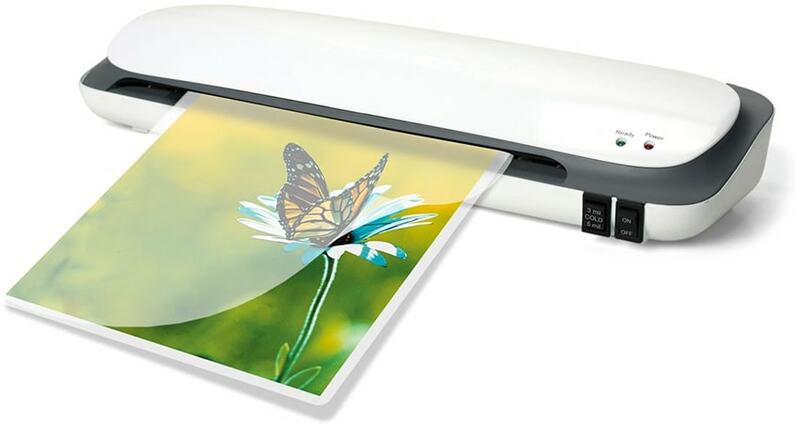 The cold laminators are extremely user friendly; perfect for home, schools, offices, and more. Pressure sensitive (cold) laminate is sticky to the touch, and features a removable release liner that covers and protects the adhesive. Benefits of cold laminators include the fact that they are often very user-friendly and easy to operate. They require no electricity, which not only saves you money, but eliminates the risk of burns as well as those accidents when machines are left on after you leave the office. There is no warm-up time, which means it is ready to go as soon as it is set-up for quick operation. In addition to all these benefits, cold laminators require little to no maintenance to keep them running smoothly. Something to consider, however, is that most cold laminating is usually more expensive than thermal laminating film. Our experienced sales specialists have put together the most important questions that need to be answered before purchasing a cold laminating machine. Review the below questions to help determine what you need. Once done, feel free to browse our selection of Cold (Pressure Sensitive) Laminators or contact us at (866)537-2244 for details on specific models to meet those needs. 1) What is your application? Different applications will call for different laminating machine solutions. Think about what you need your laminator to do... will you be laminating posters, graphics and signs? Will you be mounting prints to foam boards? Will you be creating pop-up displays? Will you be applying vinyl, tapes or adhesive films? Will the papers or inks you use in your prints be damaged by heat? You may need to do just one application; however some systems offer money saving multi-functional capabilities. Once you have determined what you want to achieve with your laminating machine, then we can start discussing the best machine to help you achieve those goals. 2) What is the largest size sheet you will be laminating? Before investing in a pressure sensitive laminating machine, be sure to consider not only your immediate needs, but any possible future needs as well. You will want to get a machine that has at least an inch or more extra space on each side to ensure proper encapsulation. It is always better to have a machine that can handle larger documents to ensure you are covered. 3) What is your volume? Smaller cold laminators are usually built for low-volume users with small applications, while the larger machines are meant for use with higher production and larger posters and signs. 4) How much space do you have to work with? 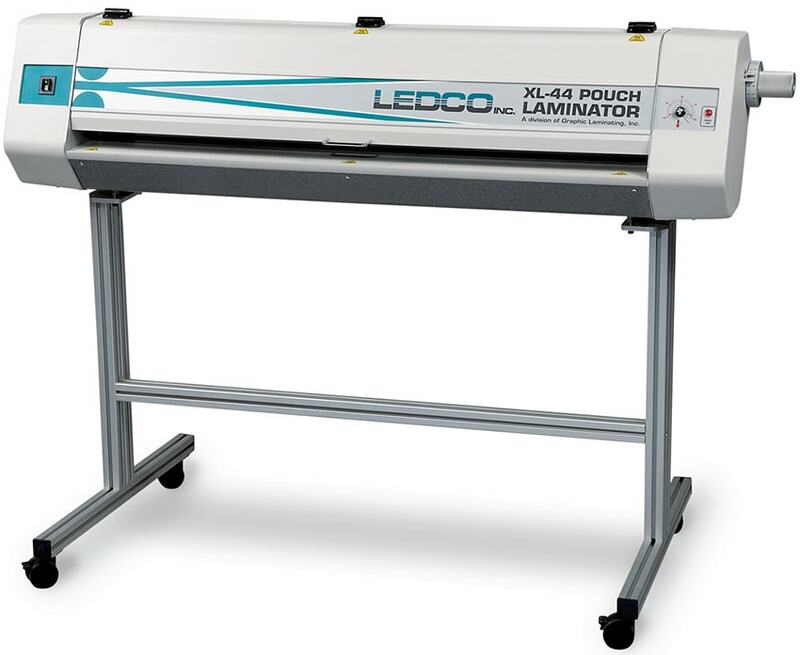 Cold laminators are available as desktop models or floor-standing models with stands. It is important to determine the space you need to work with ahead of time, and compare it to the dimensions of the machine you are considering. You should also keep in mind that you will be inserting the print on one side and it will come out of another side, so additional space on both sides is required. Wide Format Laminating is most commonly used by the printing and trade-show industries where large-scale prints need to be laminated or mounted. They are available in widths up to 65", giving you a huge range of product size opportunities. Wide Format Laminators are floor-standing models, however, some can be placed on a stand or workstation. They are built for heavy-duty and daily users who create large promotional signs, banners and more. Wide Format Laminating advantages include the allowance for high production rates, a protective and durable finished product that can be wiped clean, and a wide variety of lamination choices. However, you should consider the fact that some wide format laminating machines require set-up and training, which can be costly. With the large variety of wide format laminators available, how can you choose the right one for your? Before we dive into selecting a laminating model, we should first determine the best kind of laminator for your needs. Our experienced sales specialists have put together the most important questions that need to be answered before choosing a large format laminating machine. Review the questions below to help determine what you need. Once done, feel free to browse our selection of Wide Format Laminators or contact us at (866)537-2244 for details on specific models to meet those needs. 1) What is your application? Different applications will call for different laminating machine solutions. Think about what you need your laminator to do... will you be laminating posters, graphics and signs? Will you be mounting prints to foam boards? Will you be creating pop-up displays? Will you be applying vinyl, tapes or adhesive films? Will the applications be used outdoors, such as outdoor signage and displays? You may need to do just one application, however some systems offer money saving multi-functional capabilities. Once you have determined what you want to achieve with your laminating machine, then we can start discussing the best machine to help you achieve those goals. 2) What is the largest size sheet you will be laminating? Wide Format Laminators are available in widths up to 65". Before investing in a large format laminating machine, be sure to consider not only your immediate width needs, but also any possible future needs. You will want to get a machine that has at least an inch or more extra space on each side to ensure proper encapsulation. It is always better to have a machine that can handle larger documents to ensure you are covered. 3) Do you need heat? 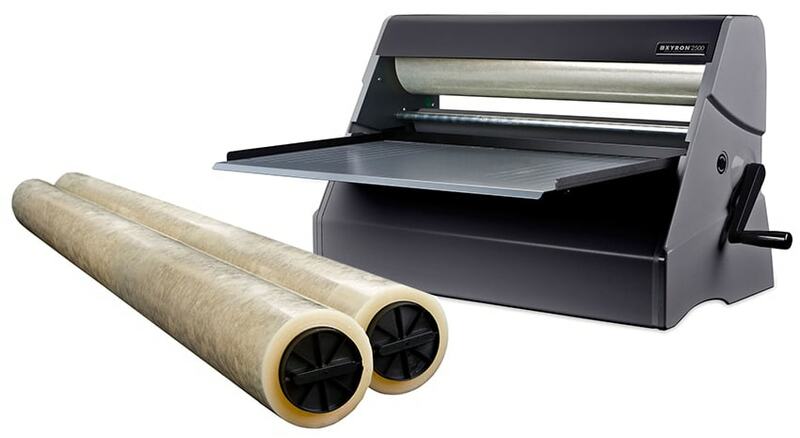 Many wide format laminators have the capability to do both heated lamination and cold lamination (also known as pressure sensitive laminating). Cold Laminating is required when the paper or ink is too sensitive to withstand the heat that thermal laminators apply. Cold lamination is usually a process in which only one side of a document is laminated. 5) How much space do you have to work with? Because wide format laminating machines are floor-standing models, they require quite a bit of floor space. For this reason, it is important to determine the space you need to work with ahead of time, and compare it to the dimensions of the machine you are considering. You should also keep in mind that you will be inserting the print on one side and it will come out of another side, so additional space on both sides is required. Having been in the lamination industry for many years, we get important questions nearly every day. This section of the A Beginners Guide to Document Laminating features a compiled list of the most frequently occurring questions, as well as some that we thought were too important not to share. 1) What kind of Lamination do I need? The lamination selection will depend on two factors: what your laminating machine can accept, and your finished application. First you want to check the user manual or instruction manual for your laminator to determine any laminate limitations you need to keep in mind, such as a maximum mil thickness, etc. Once you are familiar with these, then you can browse a selection of compatible films. Typically there are two lamination finishes to choose from in pouches: gloss or matte. Remember those high lighting situations discussed at the beginning of this guide? Matte laminating pouches can solve your problems. The pale finish reduces glare and is perfect for harsh-light situations such as low-light restaurants, super-bright production facilities and more. The glossy finish, however, is great when you want to add a vibrant appeal to your document or print. This finish actually makes colors appear more bright and vivid, increasing the appeal of the finished document. This is the most popular lamination finish choice by customers of all kinds from personal users laminating photos and awards. Laminating film is also available in gloss and matte, however it is also available in satin and soft touch with a suede or velvet-like feel. 2) Why does my document have air bubbles after I laminate it? This is usually a sign that the laminator's temperature is set too low or the laminating speed is set too fast. When a laminator isn't heating the adhesive all the way through, air bubbles will collect in spots where the laminate did not adhere to the graphic. Adjusting the temperature and speed settings should solve this problem. 3) Why does my document look milky after I laminate? If your document looks milky rather than crystal-clear after lamination, this also means that your laminator is not hot enough to fully melt the adhesive. Try increasing the heat on your laminating machine or slowing down the speed and do some more testing. 4) Why is my laminated document wavy? This issue is caused by the opposite cause as in #2 and #3. The laminator is set too hot or the speed needs to be increased. 5) Why are there wrinkles appearing in the film on my roll laminator. This is usually an easy problem to solve. Simply refer to your laminator's user manual on how to adjust the tension of the film threaded on the rollers.